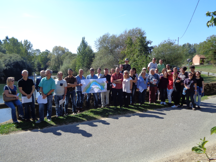 The case study excursion in the south of France on 28 and 29 September 2017 was celebrated with the guide of Klaus Peklo y Boris Chrismant, from ECOMED Project, visiting several landscape bioengineering works, carried out in Ariège county rivers. In total, different works carried out between 2000 and 2016 were examined. Their strengths and weaknesses were analyzed, as the same time that how they have evolved over time and how the same technicians would execute them from their current vision, in 2017. Tarbes: Rehabilitation through the excavation of the buried swamp and the hydraulic reconnection to the Adour River; integration of relicts of riparian vegetation in the fluvial landscape, spillway and outflow ensured by walls of trunks with vegetation. Tarbes: Rehabilitation of the right margin near the Alstom Bridge by mixed techniques in the upper part; cribwall of trunks with vegetation above the classic wall of gabions; “Réno” gabion mattresses without vegetation downstream. Mercernac: Protection of the Salat River on its left bank through bioengineering and mixed techniques. Labastide de Sérou: Reconfiguration of the Arize curve with mixed techniques and bioengineering; performing a hydraulic “thick ramp” in order to protect the riverbanks catching and directing flows. St. Felix de Tournegat: Protection of the river bank “L’Hers Vif”. Rehabilitation through bioengineering and mixed techniques next to a community road. Gaudiès: hydraulic construction of “thick ramp” with the objective of protecting the municipal road by trapping and directing the flood events towards the right side of the river; bilateral integration of the fluvial landscape of the civil engineering ramp by vegetated rap-rap. Mazères: River protection and river rehabilitation through bioengineering and mixed techniques. Steep stabilization of the rocky slope on the left side of the river near the classified medieval site; revegetation by bioengineering and mixed techniques, the latter located on the lower and submerged bank. The aim of this event at 28/29 September was to exchange points of view relating to this working field, what is good, what has to be enhanced. But also to allow the participants “in situ” to hear about and to visualize the workflow processes from design stage up to construction and monitoring stage. 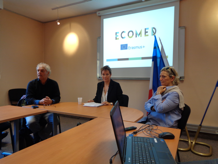 The excursion was completed with the presentation, in the DDT of Ariège in Foix, of some examples of bioengineering and mixed techniques work in the south of France, which was followed by an open discussion among the participants in order to exchange expectations and experiences. Source: AEIP (Asociación Española de Ingeniería del Paisaje) – Boletín 7 (in Spanish).